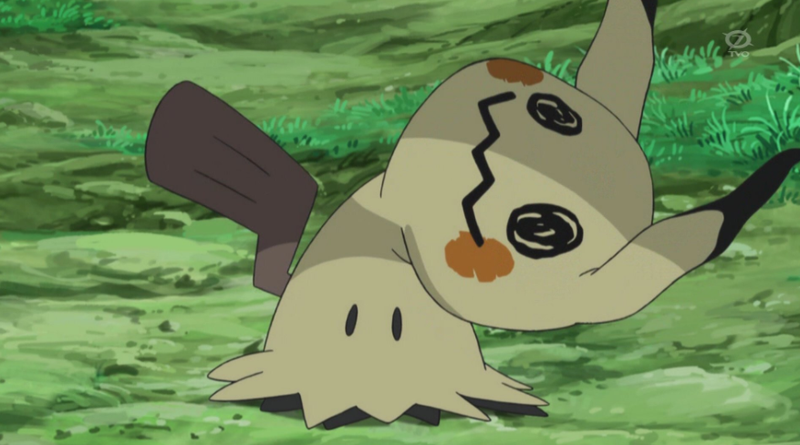 Fans felt sympathy for Mimikyu in Pokémon Sun and Moon because of a tragic backstory which claims that it dresses up in Pikachu rags because it, too, wants to be loved like the icon. That’s NOT how Mimikyu feels in the anime, though. The latest episode of the Pokémon anime aired in Japan recently, and in it, Team Rocket finally makes its way into Alola. They want to capture rare Pokémon, which as we all know are abundant in the new region. So, we see Team Rocket walking through a forest in Alola, devising a new scheme, only to come across Mimikyu. At first, they think it’s a Pikachu—a very messed up Pikachu, with a bent neck. Meowth takes a closer look, and that’s when it notices Mimikyu talking. Fun fact: Mimikyu sounds like it is choking, which is scary enough for viewers, but since Meowth can understand Mimikyu, it becomes terrified. Apparently, Mimikyu says horrifying things, though the audience is not told what, exactly, at this point. Meowth ends up going into battle with Mimikyu, lifting up its rags in defiance. Meowth wants to know what’s under there, just like everyone else. SURPRISE: it’s pure darkness, and seeing it nearly kills Meowth. Eventually, Ash and company make an appearance...and that’s when Mimikyu sees Pikachu. Ash starts a battle, and surprisingly, Mimikyu helps Team Rocket against our favorite heroes. Team Rocket wonders, why would Mimikyu do such a thing, when it was just hostile toward them? That’s when Meowth explains that actually, Mimikyu HATES Pikachu, and that’s why it wears the costume. Not out of devotion. Wow. Makes sense, though, doesn’t it? It seems ridiculous to think that the species as a whole will all love Pikachu. Surely, many Mimikyu have complicated feelings about Pikachu. Still, I’m in shock. This is way darker than I anticipated the anime to be. Then again, it takes after the games, yeah? Sun and Moon are very bleak, both when it comes to Pokedex entries, as well as the games themselves. Hopefully this means the anime will occasionally go there, because it’s way more interesting when it does.